As a child, I remember eagerly awaiting each evening during Hanukkah for the chance to light the candles with my parents, asking when I could open the gifts awaiting my attention. As an adult, I find myself spending my time asking a different question – how do I kindle the light inside myself? A light of service, of hope, of humanity. The answer is to bring comfort and hope to people impacted by disaster. In the wake of these events, our staff and volunteers carry the light of hope, service, and humanity to the communities we serve. With all the tragedy throughout the world, we can easily get bogged down by all the negativity. Instead of letting it dim our light, I encourage us all to focus on the values that bind our shared humanity – bringing hope and comfort to those in need, comforting communities and families mourning loss after disasters, and helping to bring wholeness to those who have lost so much. To all of our volunteers, supporters, and staff thank you for being such an integral part of this work. We wish you Chag Sameach. 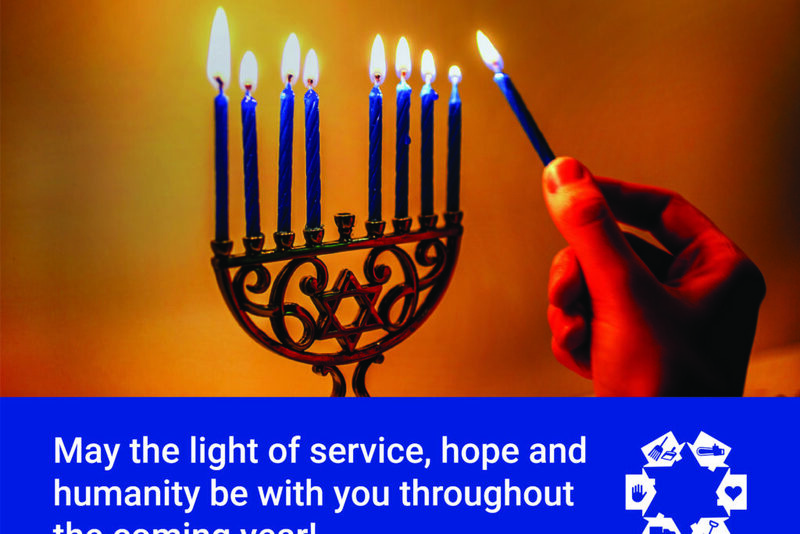 May the light of service, hope, and humanity be with you throughout the coming year.